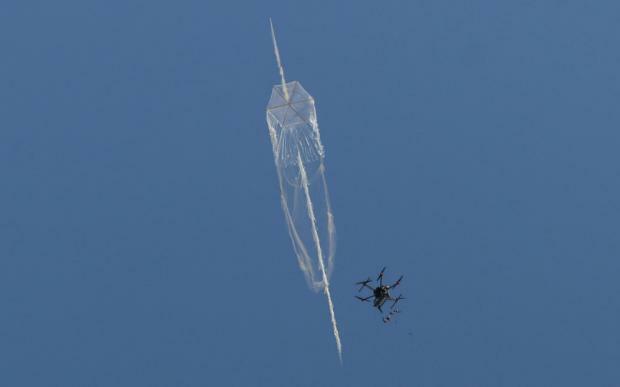 GAZA STRIP – Palestinian kite fliers are using fishing nets to disrupt Israeli drones deployed over Gaza to target and intimidate protesters during weeks of demonstrations. Colourful kites decorated with flags, slogans and patterns have become a symbol of resistance in the face of overwhelming Israeli military force, with children and youths gathering each Friday to fly what they call the “the new generation of F-16”, a reference to the Israeli warplanes frequently seen in the skies over the coastal enclave. Israeli forces have killed at least 132 people and wounded thousands since Great March of Return protests began at the end of March, according to Gaza’s health ministry, and Palestinians spoken to by Middle East Eye said kite fliers were already among those being targeted. Israel has also deployed racer drones flown by amateurs to intercept the kites. But now the kite fliers say they have succeeded in catching one of drones, by floating fishing nets into the air. “It is always exciting to challenge Israel’s weapons with the very simple resources we have,” Murad al-Zweiri, a 27-year-old who flew the first kite into Israeli territory on the first day of protests, told MEE. Zweiri, who did not give his real name for security reasons, said Israeli forces were also targeting kites with drone-fired missiles. Others said they considered the kites to be a “symbol of peace and freedom” inspired by the kites children in Gaza like to fly during trips to the beach. Abed Marwan, 25, said many children and youths were spending their summer at protest camps, rather than going to the beach. “Even if they cause damage to lands already taken by force from Palestinians, the kites are still a symbol of peace and freedom. At least they do not target or kill anyone and we are not aiming at this,” he said. Marwan said he had witnessed Israeli snipers targeting young kite fliers during the protests. Saleh Ahmed, 23, who was injured twice in a week during the protests, told MEE Israeli snipers had targeted him for flying kites near the border fence. “The first time I got injured, I was hundreds of metres away from the fence, but I was flying a flaming kite when an Israeli sniper shot me directly in the leg,” Ahmed said. Ahmed, who still attends the protests despite his injuries, said Israeli forces had also taken photos of kite fliers so “they can easily target them later”. 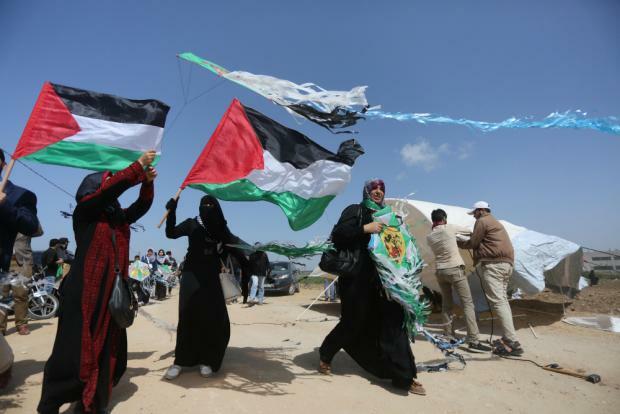 Warda al-Zebda, a 37-year-old woman who participates frequently in the protests, told MEE she felt free and a connection to her original hometown now inside Israel when she flies kites. “The reason why these youth and children moved from flying harmless kites to burning ones is the way Israeli forces responded since day one,” Zebda told MEE. “We [Palestinians] have this thing that I did not find in any other place in the world. The more they try to oppress us, the stronger and more stubborn we get,” added Zebda. According to a report in Haaretz last week, Israel has estimated the cost of fires caused by kites at $1.4m and the Knesset Foreign Affairs and Defence Committee earlier this month approved a proposal by Israeli Prime Minister Benjamin Netanyahu to deduct Palestinian Authority funds as “compensation payments”. But Anas Moin, a 24-year-old journalist, said the decision would not affect Palestinians living in the strip “since they already do not receive such funds”. The PA has imposed its own punitive sanctions on Gaza since Hamas took control of the strip in 2007, prompting protests this week in Ramallah in the West Bank. “People here have been enduring political and economic sanctions imposed by all sides for the past 11 years. Do you think one more decision will manage to stop them now?” he asked. For children in Gaza, flying kites is a summer game that could cost them their lives. Ahmed Yassin, 13, told MEE he went every day to the protest camps to create new kites. “I’ve come with my brothers and cousins every day since the beginning of the protests. 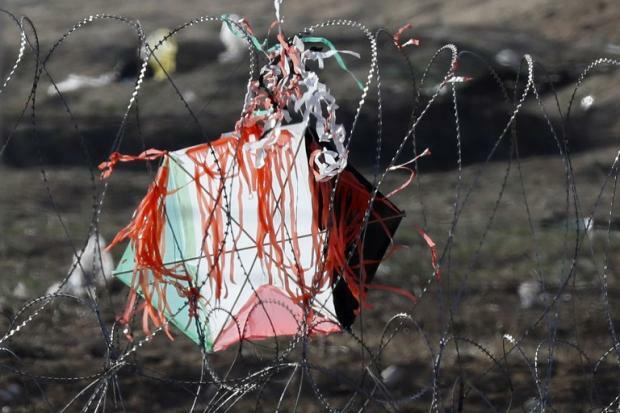 We create colourful kites with the Palestinian flag on them, and we sometimes add a flaming tail,” he said.